The word "ivy" carries connotations of old world class and high-society living. But for a gardener, ivy is synonymous with "ivy deserts," which are large areas of forest land that have been smothered to death by twining English ivy. This is because ivy is an invasive vine that covers everything it grows near. When battling ivy, it is important to select a good weed killer. English ivy smothers a plant by blocking all access to the light that the plant needs to survive. English ivy begins growing at ground level and slowly creeps up the trunk of a tree. By the time the ivy reaches the tree’s canopy, the tree already exhibits signs of stress and poor health including thin foliage. The plant also quickly escapes controlled plantings through seeds and establishes itself in unwanted locations. Killing English ivy with weed killer before removing it is an important step to help avoid damaging trees, building facades or anything that may be growing beneath the plant. English ivy produces roots from the same locations that leaves emerge from. These roots bury themselves deep in the surfaces that they grow on to assist ivy in climbing. Attempts to remove ivy without first killing the plant can damage tree bark, chunks of masonry or other surfaces. You will not be able to completely kill English ivy by spraying a broadleaf herbicide directly onto the leaves of the plant. A broadleaf herbicide may kill the plant’s foliage, but it will not destroy the plant at the roots. Instead you must poison the plant using a systemic herbicide. English ivy will pull systemic herbicides into the roots of the plant to kill the entire plant structure. The systemic herbicide that you choose should be based on the time of year that you will kill the plant. 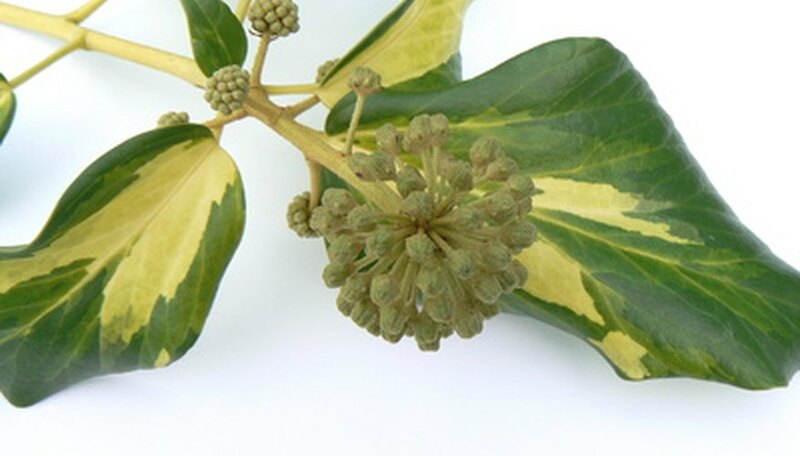 A systemic herbicide containing glyphosate is a good choice for killing English ivy in spring. For eradicating English ivy in fall, choose a systemic herbicide containing triclopyr. To treat English ivy, cut 2-inch sections out of each vine that you encounter from the end of the vine to the tip. Then paint the exposed pieces of cut vine with the herbicide. Wait six weeks and re-treat the vine. Once the vine sections die completely, remove the vine. Continue to observe the ground where English ivy was planted. The plant’s roots may continue to try to send up shoots for two more years.